When attacked, bluetongue skinks open their mouth suddenly and as wide as possible to reveal their conspicuously coloured tongues. This surprise action serves as their last line of defence to save themselves from becoming prey says Martin Whiting, of Macquarie University in Australia, who conceived the study just published in Springer's journal Behavioral Ecology and Sociobiology. 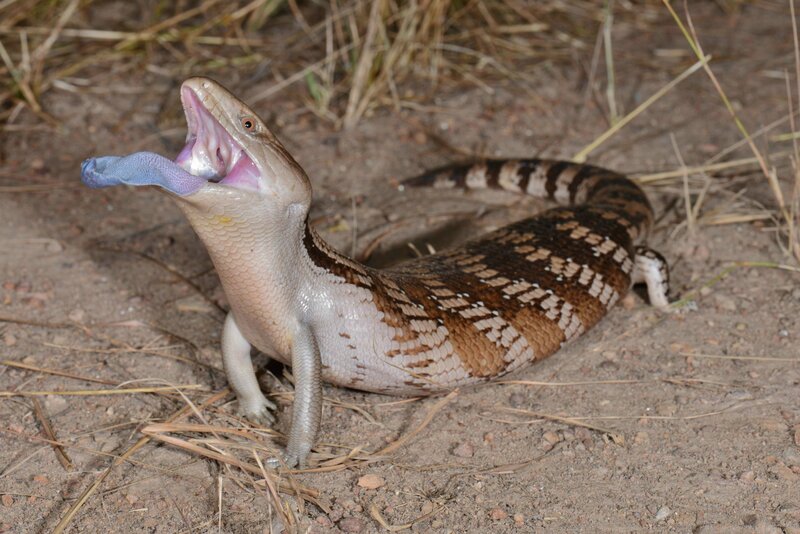 The research revealed that the back of the northern bluetongue skink's tongue is much more UV-intense and luminous than the front, and that this section is only revealed in the final stages of an imminent attack. The research team set out to investigate the tactics that bluetongue skinks use to ward off attackers, and focused on the largest of the bluetongue skinks, the northern bluetongue skink (Tiliqua scincoides intermedia). This omnivorous, ground-dwelling lizard of northern Australia is well camouflaged thanks to the broad brown bands across its back. However, birds, snakes, monitor lizards—all animals thought to have UV vision—are among its main predators.